On a very, very warm and nerve wracking Saturday nearly two weeks ago now I was lucky enough to give a little talk at The Allergy & Free From Show about breastfeeding with CMPA. 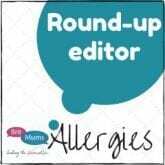 I used the opportunity to talk a little bit about our experiences, and to discuss some of my top tips for mums breastfeeding children with Cows Milk Protein Allergy. I was so incredibly nervous, but I’m so glad that I was given this platform and the response from everyone has been so lovely. After my talk I was able to chat to several families who were all at different stages of their allergy journey. One couple were just at the beginning, and after enthusiastically nodding the whole way through my speech I knew that were having a similar experience to the one we had 4 years ago. I was able to chat to them about how they were doing, what the support they were receiving was like, and what the best next steps to take were. Another mum who came up to speak of me told me how much my group and the resources here had helped with her first son, and had all meant that the second time when she had her daughter she knew exactly how to handle her potential food allergy without really needing much medical support. One lovely lady grabbed me once I had finished, and told me how much she wished we had found me 3 years ago. She told me how unwell her son had been, and how doctors had looked at her as though she was crazy when she suggested food allergies and allergens travelling through breast milk. I feel so proud to be able to support mums, especially when many of them don’t have much support coming from elsewhere, and it’s reassuring to be told that what you are doing is valid and needed, but it breaks my heart when I hear from mums who I couldn’t reach. It’s for ladies like the incredibly strong one I met at the show, for all the ladies I support every day and for all the ladies who haven’t yet found me or my treats list, that I do all of this. It’s for them that I forced myself out of my comfort zone and made this attempt at public speaking, and it is for them that I will continue to try to get these kinds of conversations out onto larger stages and into the mainstream. In case you missed my talk you can watch it below, and I will share a written version over the next few days for those that prefer to read (I definitely prefer to write so that works well for me too!). As always thank you all for your support and your encouragement, I think slowly but surely we are changing the world – one dairy free doughnut at a time.